Go nuts this summer with some fun summer patterns! Get some fun products to thrown summer parties! Use this design on an ice bucket, beach towels, koozies, or a serving tray! 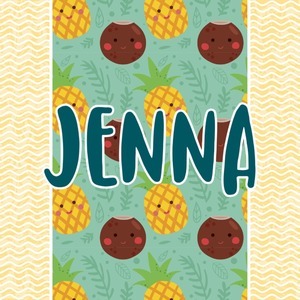 This design is filled with happy coconuts and pineapples to brighten your day. A nice teal color is used behind them, while a yellow chevron is used as the secondary pattern. Replace the wavy chevron's color to personalize it. Change the text and graphics as well! Happy designing!